Airsoft scopes are not the most appealing of accessories for an airsofter, unless you’re a sniper. 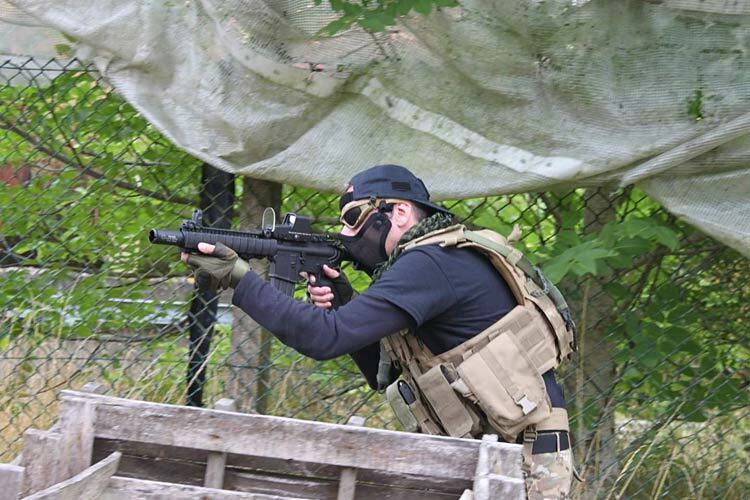 So, if you love finding your target from the shadows and you want to be the best you can be, you must be looking for the best scope for an airsoft rifle. I did a bit of research and found the best products available right now, but given that some can get pretty expensive, I also included several low-cost options. This way both beginners and advanced players can find useful information about scopes in this in-depth guide. The reason why I consider the UTG scope as being the best overall is that, besides the affordable price and impressive features, it also packs a few characteristics that are usually found on high-end products. 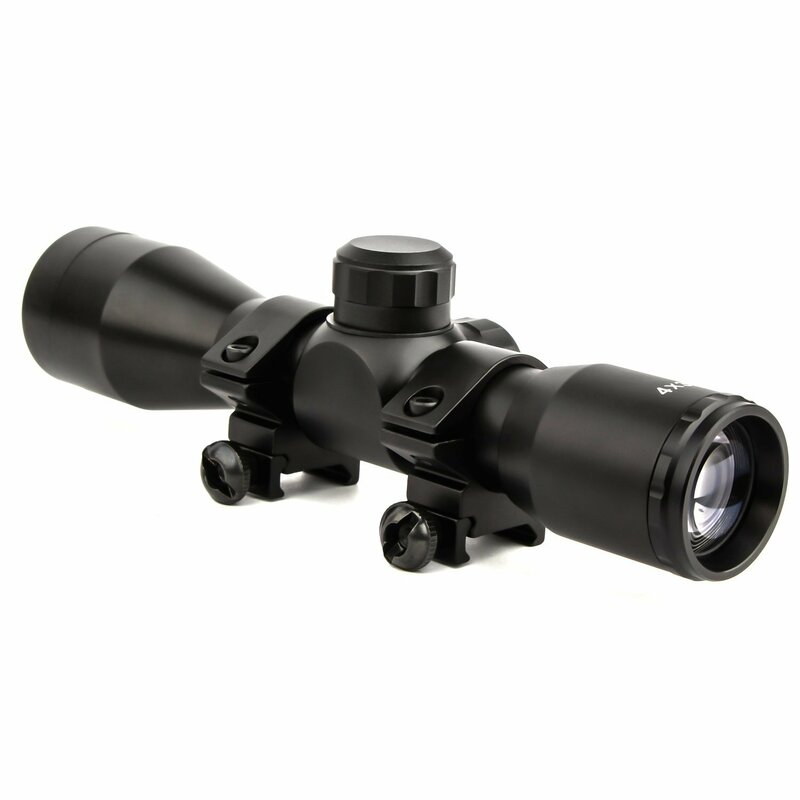 For instance, the parallax free view ranges from 10 yards to infinity and reticle system is equipped with Illumination Enhancing Technology, which provides the standard red/green color system and the 36-color multi-mode operation. This technology allows you to play (or hunt for that matter) in any weather conditions and works wonders for color blind shooters. The cool thing about this scope is that it fits on any weapon equipped with either Picatinny or Weaver rails. However, I wouldn’t install it on a cheap airsoft rifle because it is pretty big and heavy and it may throw off your balance and aim. Otherwise, it works (and looks) amazing on an airsoft replica with a metallic or ABS body that’s high-end quality. The scope itself features a metallic build and feels amazing to set up. Not to mention that the lens is completely sealed with nitrogen, which means the scope is shock, rain, and fog proof! With this baby by your side, you can take the game to a whole new level! You can also play when the sun is shining, with the angled sunshade that protects the optics from any disturbances and the multi emerald coated lenses. The turrets can be reset and locked in place for perfect accuracy and consistency (the scope keeps proper zero). Also, the Mil-Dot reticle is a nice touch, and you have MOA ¼ click adjustments for a crisp setup. The cool thing is that you can even mount it on a min gun (not that this type of behemoth needs a scope) and still be able to aim. This is due to the special circuit that doesn’t allow illumination to get interrupted even by the heaviest recoil (and this is a scope that can be used on real guns!). 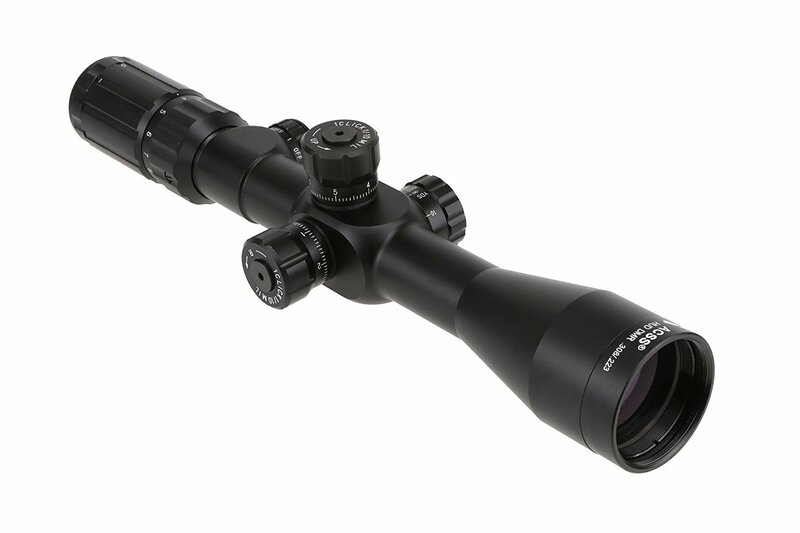 Out of the box, the scope comes with flip-open caps and detachable rings (for mounting) so you can use it as soon as it is delivered. Of course, there are some downsides as well. For instance, I noticed that you need a bit of light to see over the 10x magnification, so the scope is not always delivering the best results in low-light situations. Still, considering the price and features it packs, this is definitely not too big of an inconvenience for an airsoft player. Also, above 10X the Mil-Dots get a bit blurry when illuminated and you will lose about an inch of sight. Finally, I didn’t like that the focus knob is quite stiff, even after weeks of using the scope and setting the focus. But, I guess it’s OK that, once you set it, the scope will keep the settings regardless of recoil or other shocks. For those of you who don’t have a huge budget, but still want a high-quality scope, the Gohiking model is quite impressive. 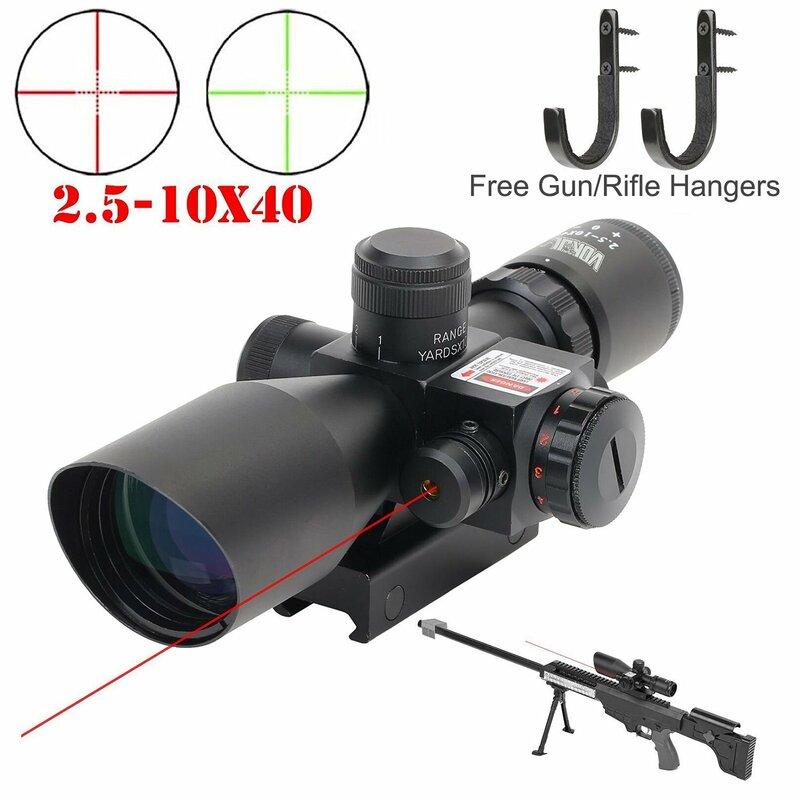 Even more, it’s a 2-in-1 purchase as you get a scope and a sight laser, which makes it amazing if you’re just starting your career as a sniper. You’ll also get a set of rifle hangers in the box, which is a very nice touch. While it won’t work in low light conditions, it does have five levels or red and green illumination, which means it will do the job just fine even if you’re indoors, in a field that uses artificial lighting or outdoors, in the hours just before nightfall. I like that the eyepiece has dioptric adjustment lens and that it allows for extra field of view while eliminating most of the aberrations that show up in the image. Also, the lenses are protected against scratches and dirt with a special coating, so you can use the scope with all sorts of ghillie suits and you don’t have to worry about your hiding place. Unlike the scope mentioned above, this one is quite lightweight and compact, so you can mount it on various replicas, even if they’re not extremely solid. It is easy to mount on Picatinny and Weaver rails, and it is delivered with all the necessary accessories so you don’t have to invest any further. Overall, I like the fact that it is lightweight, the laser is powerful, the sights are clear, and the controls are easy to use and understand. However, you may have to remove the sights on your rifle as the scope is quite low profile. Other than this, it’s a fantastic acquisition, considering the price! The Primary Arms scope is a nice piece of craftsmanship that sits amazingly well on both real and airsoft rifles. While it may be a bit of a stretch for most beginners, if you are looking for optics that will give you correct measurements at any magnification (4 or 14), this is definitely the one! I like the fact that the eyepiece has the focus adjustment handy so you can adjust it as needed, but I’m not that crazy about the magnification adjustment ring which is a bit difficult to turn. However, the stiffness is necessary if you don’t want recoil or a small bump on the terrain to change the focus settings, so I guess it’s something you can learn to live with. One feature I absolutely enjoyed is the OFF setting on the illumination hop. The scope has 5 brightness settings, but in between each step there is an OFF setting, which completely cuts the light from the reticle. In the turrets section of the scope, on the left, you’ll find the parallax adjustment control that goes from 15 yards up to 1000 yards and onto infinity (like most scopes). Right next to the parallax adjustment, you’ll find the elevation and windage settings, which are 1/10 mil clicks (I love the sound this knob makes when you turn it!). Now, the reticle is actually a ballistic design, but it still has the mil base system and allows you to appreciate distances and movement quite neatly. Finally, I love that the clarity, regardless of magnification, is of extreme quality (similar to the level of clarity you find on more expensive design). In terms of weight and length, the scope is somewhere in the middle but it has a really nice feeling when you hold it. The body is metallic but not too heavy and the mounts are fit for both Picatinny and Weaver. Overall, the Primary Arms scope is worth the money and does a fantastic job for an airsoft game! Of course, you can always use it on your real weapons and go hunting with it, so it makes a lot more sense to buy it if you’re also a real-life shooter. If you like the idea of being a sniper but you don’t have the budget to consider any of the options above, take a look at the ones below. While they are low-cost versions, these scopes come with some pretty neat features that both beginners and advanced players will enjoy. Let me start by saying that a cheap airsoft gun will look extremely stupid if you slap an expensive scope on it! Not to mention that there’s absolutely no point to even consider doing this, when you can get this bad boy for under $20! 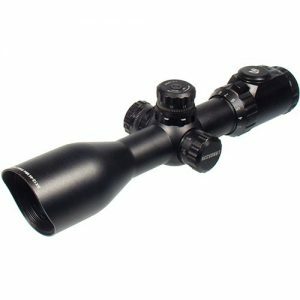 While it may not be super durable and it doesn’t come with impressive features, the Daisy scope is equipped with scope rings and has adjustable windage and elevation. It also has a cross-hair reticle and is designed to be used in fog conditions. While the producer describes it as shockproof, I wouldn’t be too eager to test this out. You should also know it takes a bit to adjust it, and you have to do this every time you take your airsoft gun out for a spin, but it will grow on you. Overall, considering the money you spend and the features it packs, this is a cool choice for a budget-friendly option. 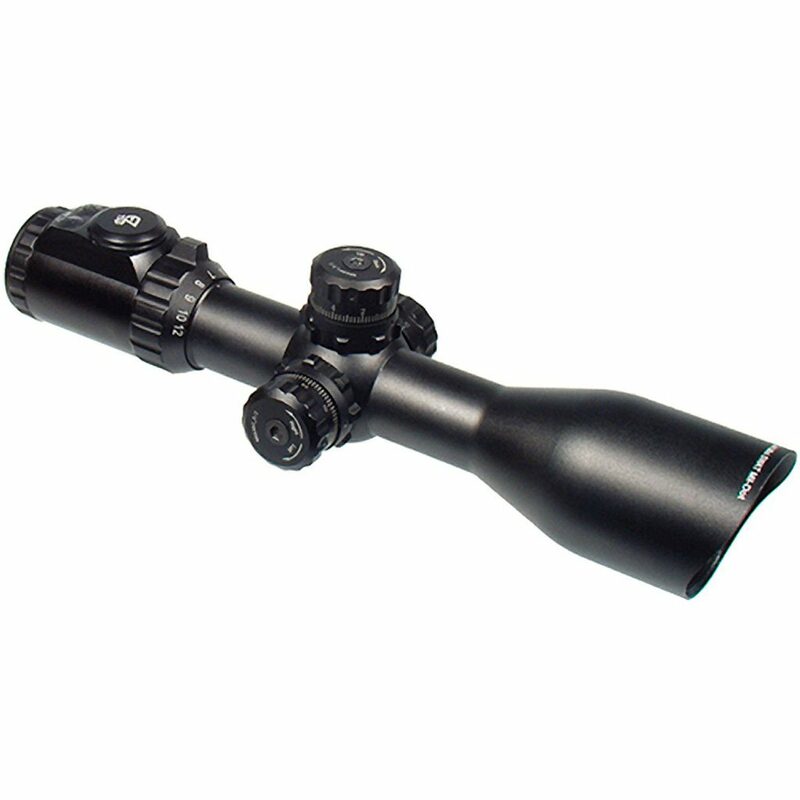 With a 32mm objective and 4-16x magnification this tactical scope features a solid build and compact and lightweight design. The AR15 scope is pretty clear due to the fully coated glass and provides good brightness and image, which is definitely impressive considering we’re talking about a low-cost option. The housing is high-strength aluminum alloy so you shouldn’t have durability problems, and the inner-structure is sealed so water can’t reach inside. I like the laser and red dot features, but if you feel they’re too much, it’s easy to remove them and only use the scope. Honestly, for the money, this compact little scope is definitely a fantastic acquisition, especially considering the fact that’s ready to mount from the box! As you can see, even low-cost options pack impressive features, but if you’re looking for performance, you have to be prepared for higher prices. It also helps to know what you’re looking for (given that the terminology is highly technical) so it’s best to learn a bit about scopes and what each feature means before making a purchase decision.